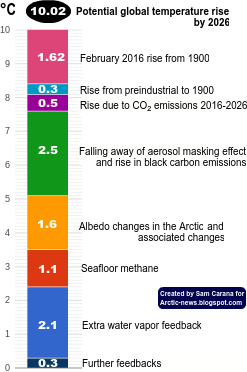 Arctic News: Is death by lead worse than death by climate? No. Is death by lead worse than death by climate? That depends on your perspective. If you are the person dying then death by climate most likely means death by starvation. Or by dehydration. Or by painful vomiting and diarrhea from drinking contaminated water. It seems to me that this slow, painful death by climate would be much worse than catching a lead projectile from afar most likely with little or no warning. If you are a journalist then penning death by lead stories allows you to write things that appeal to the visceral; namely to write about human conflict between “good” and “evil” and showing vivid images. People seem to innately enjoy reading about the competition of war or battle or insurgency and be able to cheer for a victor. To arms suppliers, it allows them to increase their profit margins. In addition, it allows politicians to have a rallying patriotic cry about the responsibility of their respective country to exercise some muscle with the pretense that they actually care about the well-being people being killed in another far off country. Or say that it is necessary to restore or create some democracy in such a country while ignoring the loss of democracy in their own country. Clearly hypocrisy. Almost inevitably armed intervention leads to a magnification of death and destruction. How can western politicians, backed by an incredibly supportive and unquestioning main stream media and catering to the interests of large corporations make so much rah-rah about 20,000 people that have experienced death by lead in an internal conflict in one specific year in some other country while completely ignoring the deaths, every single year of 400,000 people? That is the number of people, mostly children that are dying each year from climate change and carbon economies according to the DARA study that was released September 27th. Somehow this has been ignored up to now. 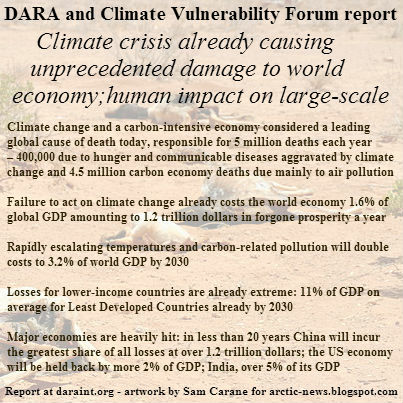 However what politicians cannot ignore so easily is the claim in the same report that the global economy is losing 1.6% of GDP every year due to climate change. Today. Not in a decade or a century but today. This cannot be ignored so easily. In fact the Saturday Globe and Mail discussed the vanishing Arctic sea ice causing global extreme weather events causing global food supply disruption in a lengthy article on the front page of the Sept. 27th Business section. 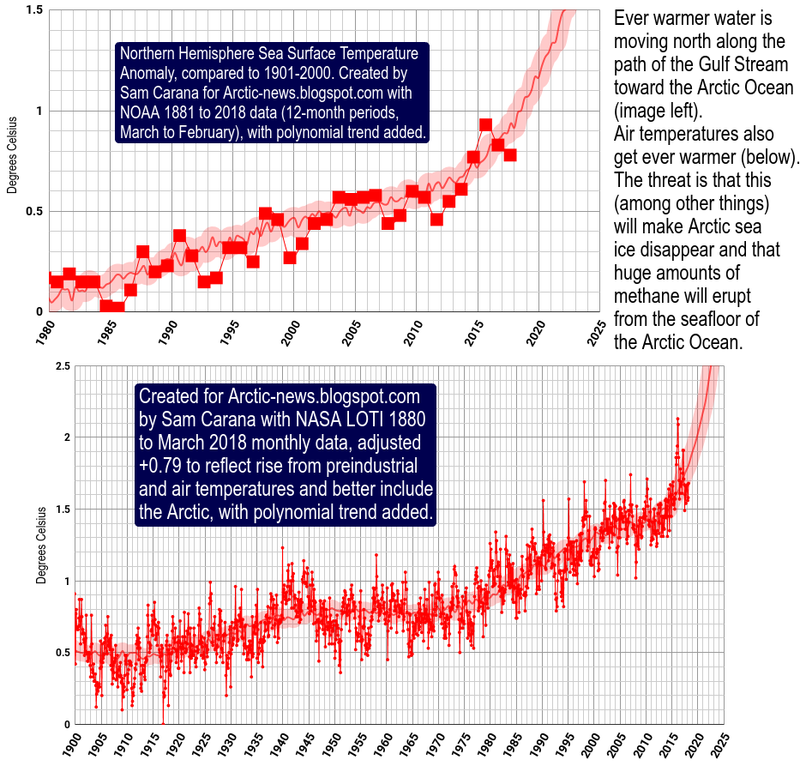 An image of the sea ice minimum of September 16th was even on the next page. Never before in the history of the Globe have I seen such a thing! Why was the article there? Not because of concern for sea ice or worry of extreme weather but because of the 1.6% GDP loss occurring today. Expected to rise to 3.5% of GDP loss 2030. Things are different now. Our world is changing rapidly, in real-time, before our very eyes. Just watch a video of the ice this summer. We have never experienced abrupt climate change before. For decades, many climatologists have been warning that the energy balance of the earth is out of wack. Now, to the tune of the equivalent of 0.6 Watts per square meter over the entire surface of the planet. Isn’t this small, a Christmas tree bulb is a Watt or two? No. James Hansen calculated that this imbalance is equivalent to the energy of 300,000 Hiroshima sized bombs popping off every single second on every day of the year, year in and year out. Half of this energy is warming the atmosphere and half is warming the ocean. It is not small at all. Sounds like insanity to me. But I am biased. I live and breathe climatology and meteorology. Thus I know the dangers that climate change can bring much more deeply than others and I want to bring others up to speed. Quickly. Stress of heat increase affects emotions of people hence the term cool down or slow down. But the expression of heat rise on Earth by force of increasing levels of heat trapping gasses in sky isn't emotional, its physics and thermodynamic law. Nature was an open system with ability to self heal and the rise of increasingly complex forms life supplied flexibility and back up was held and written in love of parent for child. Open system fundamental not within properties of physical properties of elements that trap heat..
A form of entity more similar to mineral than life.. A closed system of expansion of contractual obligation and hiding of responsibility behind a dark opaque wall of law. Not Law of the Universe that lives but one of man's creation in order to exploit or plunder.